I love everything about history. 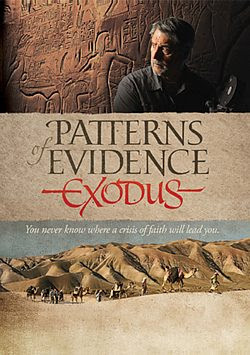 Patterns of Evidence: Exodus was a very informative documentary and was produced with great quality and a beautiful soundtrack. While doing some reading and research I learned that filmmaker Timothy Mahoney spent twelve years making this documentary. I must admit it was a little slow for me at the beginning but all in all I got a lot of information out of it. For more than 50 years, the vast majority of the world's most prominent archaeologists and historians have proclaimed that there is no hard evidence to support the Exodus story found in the Bible. In fact, they say that the archaeological record is completely opposed to the Bible's account. This view of extreme skepticism has spread from academia to the world. The case against the Exodus appears to be so strong that even some religious leaders are labeling this ancient account as historical fiction. Filmmaker Timothy Mahoney begins with the questions, "Is the Bible just a myth, or did the archaeologists get it wrong?" He decides to tackle this issue wit a deliberate scientific approach. After examining the details in the biblical text, he journeys across the globe to search for patterns of evidence firsthand. The result is the most in-depth archaeological investigation into the Exodus from Egypt ever captured on film. This scientific documentary's goal is to communicate the TRUTH of the Bible and help equip believers with defending their faith and the Bible. Now, this is just what he thinks the truth is of this biblical period in time. He's presents some good evidence as well. We all come to our own conclusions of what may have happened, but just make sure you're reading God's word. That I can say with a fact is absolute truth. My take on this is that God doesn't want us to get hooked up on the specifics of when and where everything happened. IT HAPPENED! God is faithful to fulfill His promises. Some people need actual evidence and we can learn some things in the process. I Mahoney lots of credit for going on this journey and sharing with us. This was something I read and I thought this was a great comment and I share his sentiment. You can purchase your copy on Amazon or the official website.